My Little Shoebox is a company that has been around since the spring of 2005. Their most recent release, for CHA Summer 2009, is by far, the cutest set of collections from them. Including, the collection titled “Imagine a Forest”. When I first saw the sneak peeks back in July, I just knew that I HAD to have all of it. I love the soft colors, the forest of trees, and cute little squirrels. It is such a sweet collection, perfect for highlighting your fall pictures. Each paper is double-sided. One side is great for using as a background, while the other is handy for borders, fussy cutting and creating your own embellishments. There is even a matching die-cut sheet of patterned paper. The paper has the perfect weight to it. You can distress it without ripping it, but it’s thin enough to punch easily. The collection also includes a sheet of die cut cardstock, an overlay sheet, and three different alphabets to choose from. There is a chipboard alphabet, a glittered epoxy set, and those teeny tiny “Mini Alphabet’ stickers that everyone loves. -The weight of the paper is perfect for distressing and punching. -The paper is double-sided. You get more for your money. -The cute images and colors are perfect for fall OR girl themed projects. -I wish there were more borders on the die-cut cardstock sheet. -The overlay would be easier to use if it were die-cut as well. -I would love to see more letters in the glitter alphabet set. Available at: TwoPeasInABucket.com, *ScrapGal.com, and Ally Scraps. I really enjoyed using this collection! I saved the scraps to be used again on other projects. What do YOU think? What are your thoughts on this collection by My Little Shoebox? Aren’t those little squirrels the cutest things ever? Will you be running out to get some? Or do you already have it? If so, do you love it as much as I do? I absolutely adore anything that My Little Shoebox comes out with. 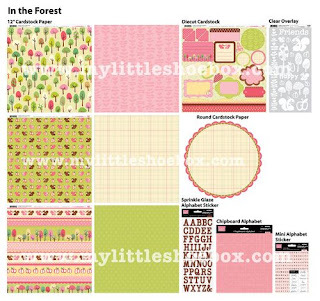 Imagine a Forest is just too darn cute and I've already purchased several pieces of the paper. I agree with you about the overlay - it would be really great if it was die cut as well! Thank You for the wonderful insight !!! I love your LOs!!!! You are awesome !!!!! Love this line--it is a cut above some of the other lines that are out now. Seems there was a lot of thought put into this one. Cute stuff! thanks for the insightful review and the lovely inspiration, mandy. My Little Shoebox has really hit the bullseye with this line. I love how much you used those circles and half circles. I never know what to do with those and you gave me some great ideas! Love this line! Great article...Fantastic LOs!!!!! I had never heard of this web site before you mentioned it. I've enjoyed reading the reviews. I think this is a really cute line, a little too pink for me but really sweet. Great projects! Thanks for reviewing it. The comment about it being easy to punch may have swayed on this collection. Your "HI" card is sublime! I'm kinda over the forest cuties trend but the paper is beautiful! I love it. What an adorable line. I am so glad you have this site, I get to see alot of cool stuff I'd never know existed otherwise.